The UIP4000hdT delivers up to 4kW ultrasound power and is a reliable production machine even under demanding conditions. It is designed for industrial processes with a higher energy demand and large volumes. The UIP4000hdT is a robust and powerful ultrasonic processor. Typical applications of the UIP4000hdT include homogenization, emulsification, dispersing & particle fine milling, extraction, malaxation of olive oil, dissolving or sonochemical reactions such as sono-synthesis and sono-catalysis. This high-power system is particularly favorable, since no additional cooling media, such as water or compressed air, are necessary. The special design of this system allows for its use under extreme operation conditions, such as dust, dirt, temperature and humidity. The ultrasonic processor consists of titanium and stainless steel. The oscillation-free flange has proven very useful for the integration into machines and plants. It has been adapted to the new technical conditions in terms of correct oscillation-behavior. The modular concept of the UIP4000hdT provides you with a powerful and yet very space-saving system. The transducer and generator are housed separately from each other and are connected via cables. The self-contained design reduces the work required for installation, operation and maintenance to a minimum level. Multiple UIP4000hdT modules can be easily combined to form clusters with higher process capacities. In general, the flow cell as well as the ultrasonic transducer are located in a double-walled stainless steel cabinet that comes with a very effective sound insulation. If required, the UIP4000hdT can be used for the sonication of liquids in custom-specific reactors. Of course, the UIP4000hdT is capable to run continuously at full power output (24hrs/7days) like all ultrasonic systems from Hielscher Ultrasonics. A great enhancement from the operational view is the colored touch-screen. This touch- and stylus-sensitive screen allows for easy handling, whilst the accurate setting of operating parameters and the display of the ultrasound power setting are guaranteed and combined with highest comfort for the operator. The digital control menu is intuitive to use as reduced to the main settings. The amplitude/ power setting and the pulse mode can be adjusted by a colored touch-slider (with 1%, 5% or 10% snap). The user decides, if he prefers the display of amplitude and power as colored bar graphs or numerical representation. The display can be changed from regular view mode to BIG NUMBER display mode, characterized by heavy contrast and big font-size for improved visibility. The UIP4000hdT can be controlled using any common browser, such as Internet Explorer, Safari, Firefox, Mozilla, mobile IE/Safari using the new LAN web interface. The LAN connection is a very simple plug-n-play setup and requires no software installation. The ultrasonic device acts as DHCP server/client and requests or assigns an IP automatically. The device can be operated directly from the PC/MAC or using a switch or router. Using an optional pre-configured wireless router, the device can be controlled from most smartphones or tablet computers, e.g. the Apple iPad. Using the port-forwarding of a connected router, you could control your UIP4000hdT via internet from any place in the world – your smart-phone or tablet being the remote control. Another smart feature of the UIP4000hdT is the operation and control via LAN (local area network) which facilitates the operation and allows for high processing flexibility. All information of the sonication process is recorded on SD/USB data card, automatically. A plugable sensor measures the temperature permanently whereas an optionally available pressure sensor can be additionally plugged. 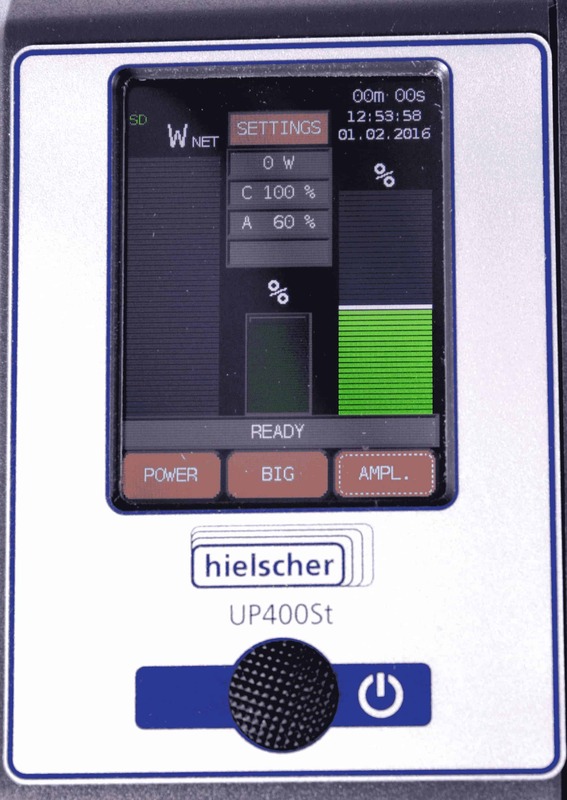 Like all Hielscher ultrasonic devices, the UIP4000hdT comes with an intelligent automatic frequency tuning. When the device is switched on, the generator will sense the optimal operational frequency. It will then drive the device at this frequency. That improves the overall energy efficiency and reliability of our ultrasonic devices. All you need to do, is to switch the system on. The generator will perform the frequency tuning automatically in a fraction of a second. Hielscher Ultrasonics’ industrial ultrasonic processors can deliver very high amplitudes. Amplitudes of up to 200µm can be easily continuously run in 24/7 operation. For even higher amplitudes, customized ultrasonic sonotrodes are available. The robustness of Hielscher’s ultrasonic equipment allows for 24/7 operation at heavy duty and in demanding environments. Contact Us! / Ask Us! Please use the form below, if you wish to request additional information about ultrasonic homogenization. We will be glad to offer you an ultrasonic system meeting your requirements. Not sure which ultrasonic system is the most suitable for your process? Ultrasonic homogenizers are used for dispersion, emulsification, wet-milling, nano- & micronization, extraction (from plants and cell tissues), synthesis and catalysis of chemicals (so-called sono-chemistry) as well as degassing. Ultrasonic homogenization is often used as umbrella term that includes all these fore-mentioned applications. The ultrasound-assisted homogenization is based on the working principle of acoustic caviation, which occurs when intense ultrasound waves are coupled into a liquid medium. Under the intense ultrasound waves, minute vacuum bubbles are generated in the medium, which grow over the high pressure / low pressure cycles of the ultrasound waves. At a certain point, when the micro-bubbles have reached an energetic status, at which they cannot absorb more energy, they collapse violently. This phenomenon of vacuum bubble implosion is called cavitation. The implosion of the vacuum bubbles generates shock waves, streaming / liquid jets, high shear, high temperature and pressure differentials with sufficient energy to break covalent bonds, flex molecules and induce chemical reactions. Hielscher’s high performance ultrasonic processors use piezoelectric generators made of lead zirconate titanate crystals. The vibrations are transmitted down a titanium horn tuned resonate at 19-26 kHz. From the horn the ultrasonic vibration is coupled via ultrasonic sonotrode (tip, probe) into the fluid medium. 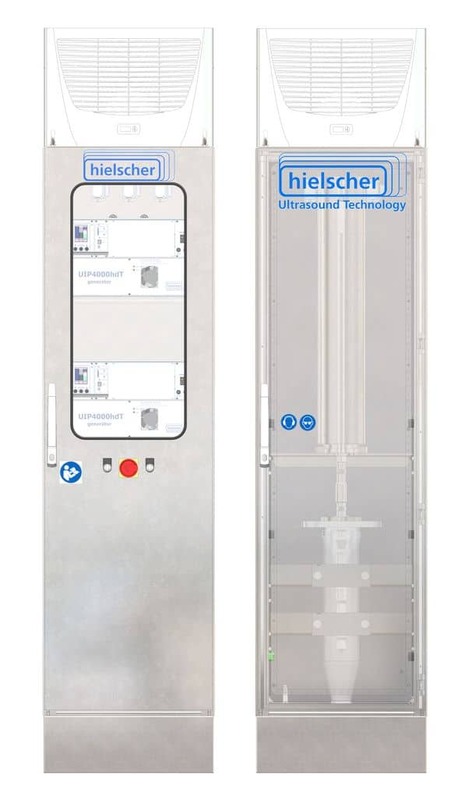 Hielscher offers ultrasonic processors with power ratings from 50 to 16,000 watts per ultrasonic unit and covers thereby the requirements from small lab ultrasonicators and bench-top devices up to pilot plant and fully commercial ultrasonic units for high volume throughput. Sonication conditions are crucial for output, process results and reproducibility of ultrasonic processes. Besides the precise control of ultrasonic power output, adjusted by amplitude and intensity, temperature, pressure and sonication time are important factors. Hielscher’s digital ultrasonic processors come with a plugable thermo-couple. A plugable pressure sensor is optionally available. Both sensors are connected with the ultrasonic generator, which is equipped with an internal SD card. The software of the ultrasonic device writes all process data (date, time, amplitude, ultrasonic energy, net energy, temperature, pressure) in a CSV file on the SD card. This makes your sonication runs comparable and reproducible. For high amplitudes, a higher output power is required. Under increased load such as high viscosity of the medium or elevated pressure, an increased ultrasound power is needed to drive the sonotrode at a desired amplitude. The larger the front surface of the sonotrode (tip), the more power is required to let it resonate. With a larger sonotrode, larger volumes can be processed. Hielscher’s industrial sonotrodes and cascatrodes can deliver very high amplitudes. Amplitudes of up to 200µm can be easily continuously run in 24/7 operation. For even higher amplitudes, customized ultrasonic sonotrodes are available. The sturdiness of Hielscher’s ultrasonicators allows for 24/7 operation under heavy load and under demanding conditions. For most ultrasonic processes, temperature of sonicated medium should be as low as possible for a low temperatures promotes the generation of intense cavitation. Hielscher offers ultrasonic flow cells and reactors with cooling jackets, which support the maintenance of optimal process temperatures. Flow cells and reactores are pressurizable, too. Under elevated pressures, more intense cavitation occurs. 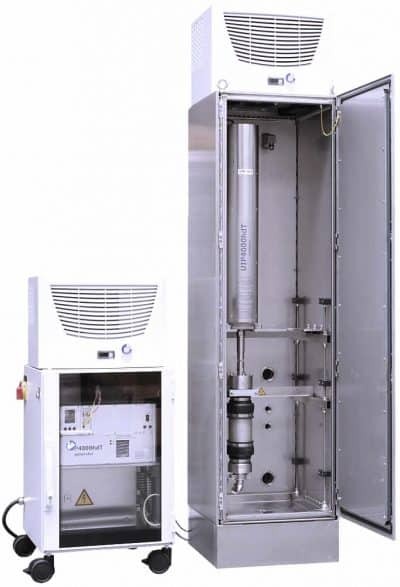 Therefore, Hielscher offers reactors that can easily pressurized up to 300atm. Hielscher Ultrasonics manufactures ultrasonic probes of different sizes and shapes (e.g. cascatrodes), which allows to scale up all ultrasonic process results completely linear. With 16kW ultrasonic homogenizers and manifold types of sonotrodes and flow cell reactors, Hielscher is your long-term experienced partner for ultrasonic processes on industrial scale. 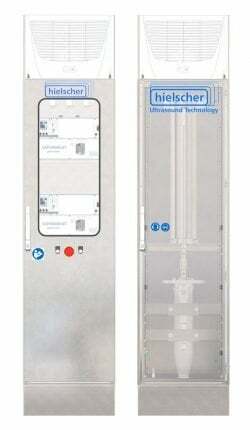 Besides the variety of standard ultrasonicators, Hielscher designs and manufactures customized systems, too.